I purchased a 2 TB Passport 2 drive several months ago and it is now full because the WD Backup software does full backups, not incremental, and has no way to automatically delete a backup after a certain period of time. Is there a way to delete specific backups using this software? When I select delete backup, it only gives me the option of deleting the oldest version of the backup. I'd like to remove some of intermittent backups, maybe two out of every three days, at least for BU's over a month old. I may have to purchase some other backup software to get incremental backups and automatically delete aged backups. Any body have any suggestions? That will delete any backups older than 5 days. You will need to change your c:\backups to the backup location. I would like to keep some of those backups. Is there similar script that will work for a single date? You stipulated you wanted to remove backups after a certain date right? So what is that date from today? 2 months? Does that all go a .bat file a vbscript file, or something else? I think that should work, you'll need to specify your dates. I smiled.... :-) Alex's homework.. If you use treesize, it should tell you which folders are the biggest. where the ###aaaa looks to be sequence numbers and with modified dates ranging from 12/23/16 - 2/4/17. This is because I'm making changes in my VM daily, this is where I do most of my work. In other folders, it may only have two copies of a file, one which indicates the first backup of the file, dated 12/23/16 and another which looks like: filename.extension with the added characters "_LAST". I assume that when the backup occurs, it compares file properties of this "_LAST" copy to the current version and then creates a new copy if there have been changes. The problem is that many of these VM files are over 4 G, and since several of the files inside the VM are changing almost every day, it is backing up the entire VM drive. So, as an example, one of my VMs has 60 GB dedicated to it, and the BU software is backing up that entire 60 GB VM every day, despite the fact that only four or five actual files might be changing in the VM on a given day. 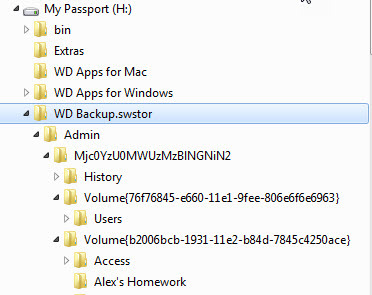 I could go in that folder and delete all the files from January 2nd, but I don't know what effect that will have on the WD backup software. I'm tempted to simply reformat that 2TB drive and try something different..
Alex, appreciate the trouble you went to on this one. But I decided to take the easy way out. I purchased Acronis True Image as had been recommended to my on several occassions. I've been running it for a couple of months now and am very pleased.